Jessica is a Bellingham artist, winner of our 2016 poster art contest. She is the mother of two who tries to draw everyday. Sarai Stevens is the mother of three boys, a permaculturist, forest gardener and one of the Market Ladies. 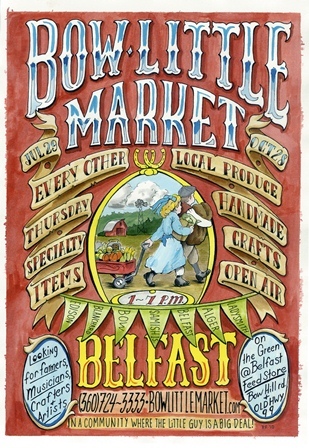 She used her skill as an artist to create 2013’s unique poster. Through her involvement in the Bow Little Market and Chuckanut Transition, a movement to help foster a renaissance of community and local economy, she is nurturing the growth of resilient communities within the Samish Watershed for her children and her children’s children. Stan Ross began his artistic career when he sold his first painting to a children’s hospital at age 9. He taught Elementary and Secondary Art for 25 years before moving to Washington in 1999. He also holds a B.S. degree in Commercial Art and designs and produces brochures, booklets, and assorted promotional items. He also paints professionally, exhibiting in local shows. His current medium of choice concentrates on a combination of watercolor with a wax resist on rice papers. His subjects are varied, anything that triggers an emotion. He now divides his time between gardening, making art, and substitute teaching. 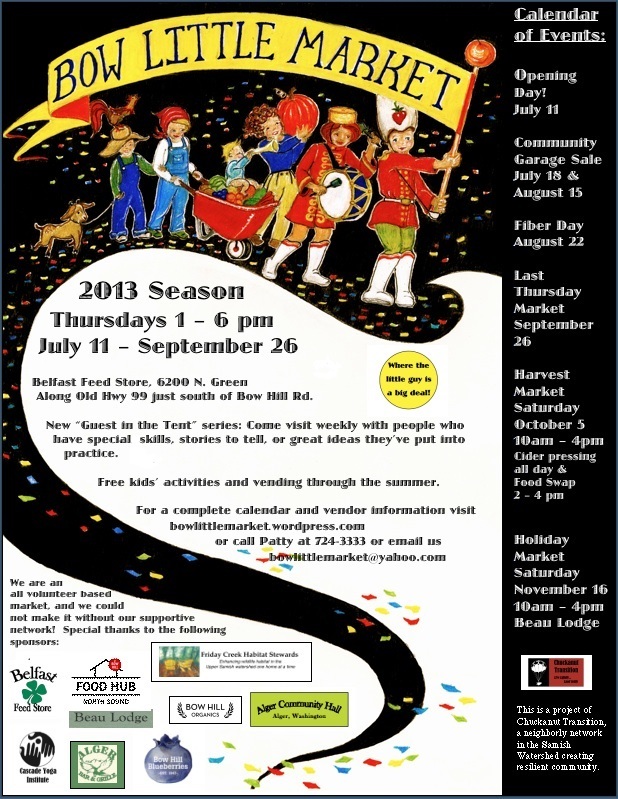 Sarai Stevens, Bow, WA, created our 2011 poster. 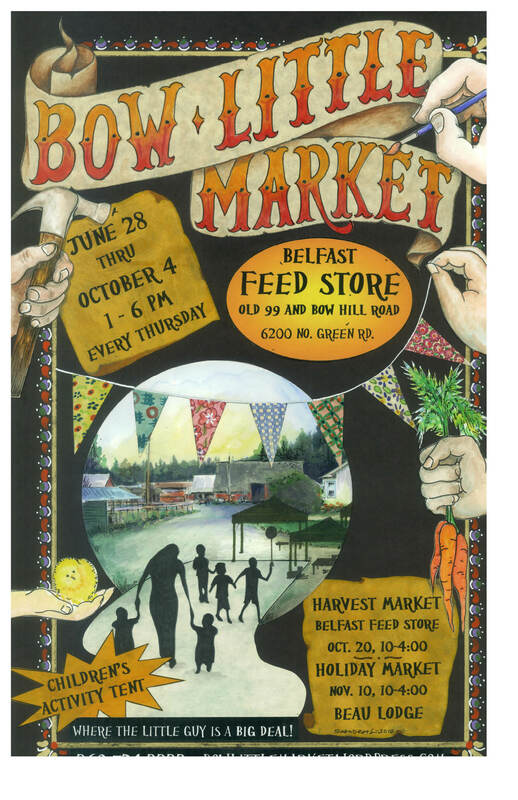 Paul Foertch, Bow, WA, was our 2010 poster artist. 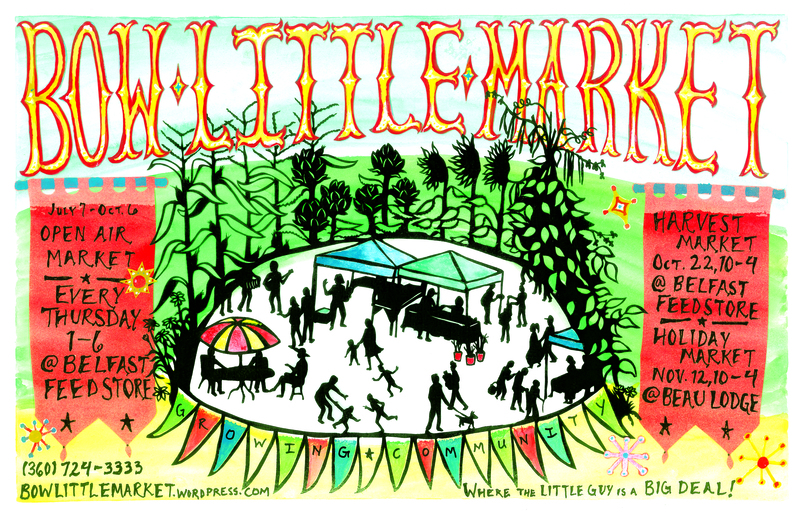 Paul Foertch was our first volunteer artist of the Bow Little Market poster. He is a well-respected tattoo artist at Old School Tattoo in Bellingham and part owner of Unicorns Rock T-shirt Company (www.unicornsrock.com). You can contact him for commercial art at 360-305-8995 or through his company website.